Institutional reform expert Serge Rumin opened the discussion with a detailed description of reform processes, focusing on vetting. From watching the revolutions across the Middle East and North Africa unfold, Rumin began, it was clear that the security sector reform issues would be at the core of the transition that followed. But this raises two very basic questions: how do we define the security sector and what does it mean to reform it? The security sector includes the ministries which govern security, as well as the police and security forces themselves, he explained. And security institutions are inherently a part of the society in which they operate. Society provides the means for security operations, both in personnel and funding, traditionally through taxation. They should therefore be accountable to civil society. To illustrate the dilemmas faced in seeking to establish accountability for violations through reform, he shared an anecdote from a former chief of police in Rwanda, who asked: "What am I going to do about my police force? Half their relatives are in prison as perpetrators of genocide, and the other half are buried in the cemetery as victims of the genocide." The key goals of the reform process are to rebuild trust in security institutions and preventing future abuses. He explained the process of vetting, the evaluation of individual members of the security sector. Vetting is not punitive, he maintained. It is rather to build an institution that society can trust to protect against, rather than promote, violations of human rights. Echoing the sentiment expressed in the session on criminal justice, he cautioned that a country cannot solve political problems through vetting and institutional reform; this is a technical process. However, political will and the political power with which to enforce the reform is essential. Reform is also insufficient in itself, he stressed, and must be a part of a broader transitional justice strategy. Human rights expert Miranda Sissons furthered the discussion on institutional reform, focusing on the example of de-Baathification in Iraq as providing critical lessons of how institutional reform can go wrong. De-Baathification was a series of processes which took place between 2003 and 2008 with the goal of preventing the resurgence of the Baath party in Iraq. Iraqis wanted accountability, but there were too many people to prosecute, Sissons acknowledged. Because of this, there was widespread support for punishment only of key officials or leaders. But this was not followed, she continued. Most of the highest levels of management of the public service - 65,000 in all - were dismissed, and the army was dissolved, to the detriment of both the reform process and overall security in Iraq. Sissons concluded the presentation with specific recommendations directed at countries seeking to reform the security sector, lessons learned from the failures in Iraq. These included the need to be clear in the objectives of the reform process; and the recognition that institutional reform is not a comprehensive transitional justice strategy and must be combined with other measures such as reparations, criminal justice, and truth-seeking. She also stressed the need for the powers of the reform agency to be clearly understood and defined, and the need for impartial oversight for the processes, especially when reforming the electoral process. 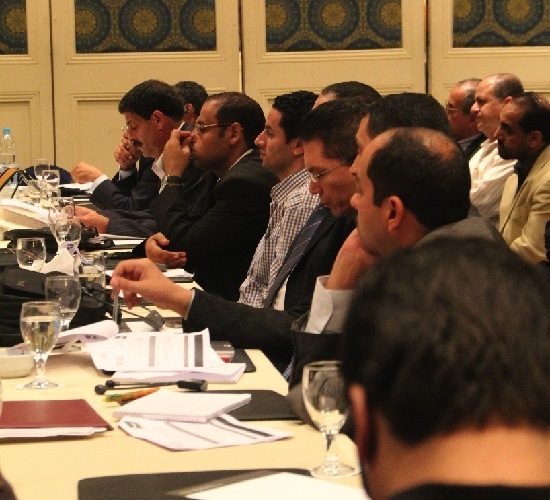 Questions asked by the conference participants debated whether institutional reform and the lessons learned from the case of Iraq could be applied in the Egyptian process. The conference will continue tomorrow, October 31, with sessions on domestic trials, preventing the recurrence of abuses, addressing issues of corruption, and involvement of the International Criminal Court in the region.